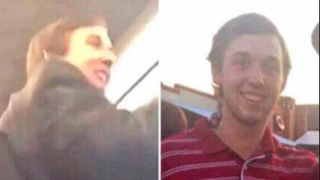 Parker Rice (in video image, left, and photo, right), identified as the conductor during the University of Oklahoma’s Sigma Alpha Epsilon chapter’s racist sing-along, was one of two students expelled as a result. The fallout from a video that captured members of the University of Oklahoma’s Sigma Alpha Epsilon chapter singing a racist chant continued Tuesday as university President David Boren announced that two students have been expelled. Boren said that both students, Parker Rice and Levi Pettit, played “a leadership role” during the party-bus ride’s racist sing-along. At this point, all I can do is be thoughtful and prayerful about my next steps, but I am also concerned about the fraternity friends still on campus. Apparently, they are feeling unsafe, and some have been harassed by others. Hopefully, the university will protect them. Shortly after publishing Rice’s apology, the Morning News received a statement from Pettit’s parents condemning his behavior while explaining that he is a “good boy” and apologizing to those hurt by his words.